It’s funny, the kind of food you fall in love with. I grew up in a pretty Christian neighbourhood, but not too far away was a big Jewish area, and that always had a strong pull for me. Early Sunday mornings were spent buying bagels, and words do not begin to describe my love of lox. But it wasn’t until high school, when I became friends with a Jewish girl and started being invited regularly to Sabbath dinners when I really started to appreciate the food of that culture. I don’t ever eat Jewish food now, because there pretty much are no Jewish people in Vancouver. I mean, there are a few. But it’s slim pickings. 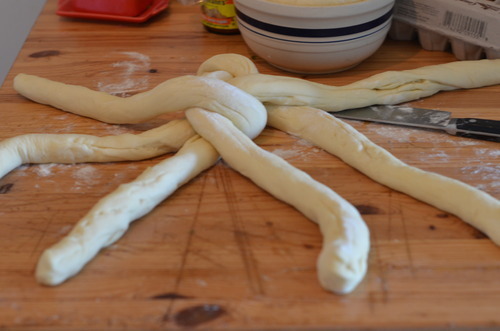 Which is why I found myself on a hot summer day making challah. 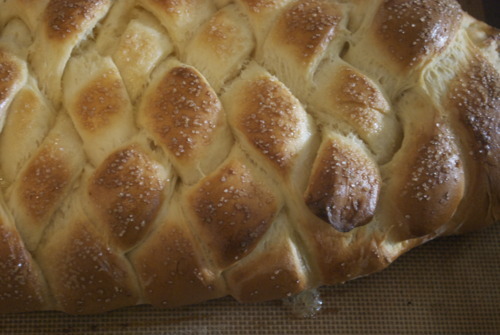 Challah is brioches sister, the prettier sister. 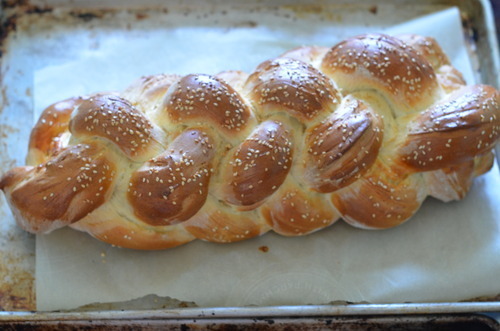 The main difference is that there is no dairy in challah, instead the eggy dough has olive oil added to it, instead of butter- this keeps it Kosher, but as I don’t keep Kosher (as I’m not Jewish) I slather butter on mine once it’s cooked. 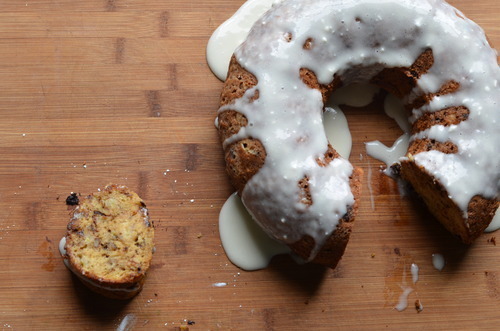 This will also make the best damn French toast you have ever had. 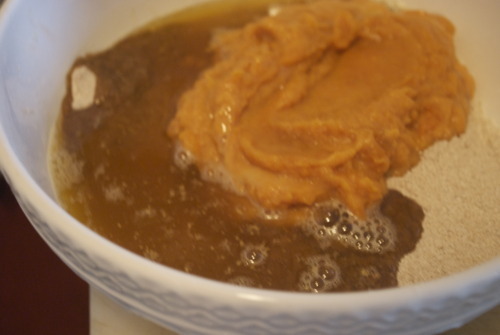 In a large bowl mix together the yeast, water and honey. 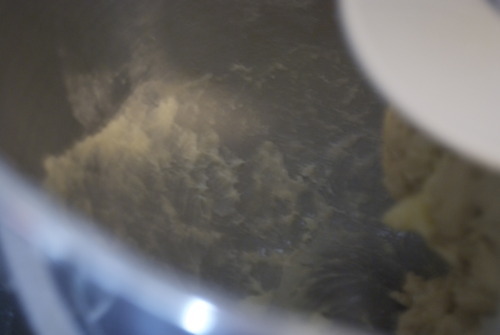 You can also do this in the bowl of a standing mixer. When it starts to get foamy add in the oil and 4 eggs, stir to combine. I only needed 7 cups, but you may need more. 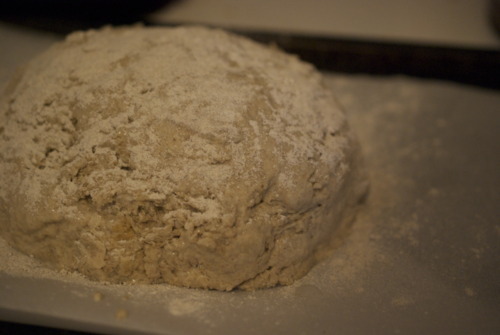 Once the flour is combined, begin to knead. If you use you’re Kitchenaid it may be a bit much for your machine- I am lazy and didn’t want to knead it, so I split the dough in two and did it that way. 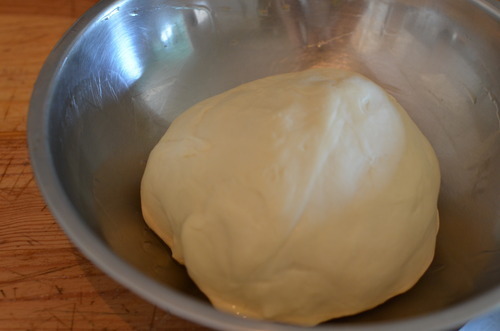 Put the dough in a greased bowl. Let is rise for an hour, then punch it down, and let is rise for another half hour. 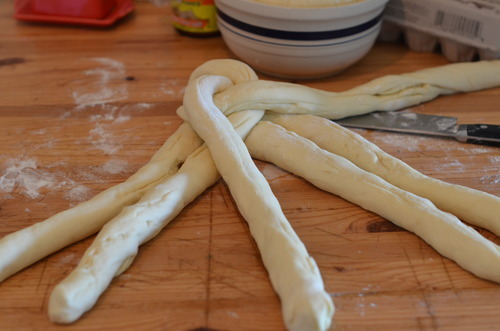 Divide the dough into two portions. 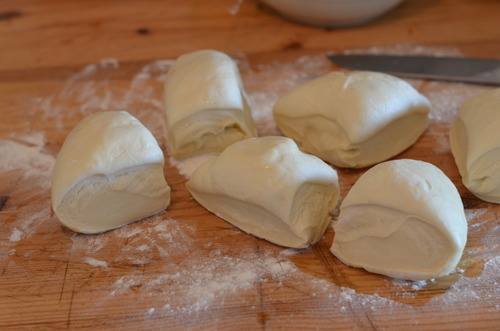 You can make them into loaves, braided loaves, buns (the best hamburger buns!). 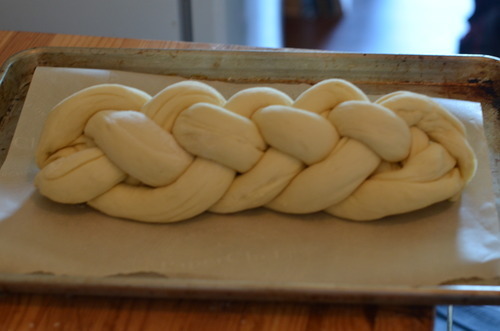 I did a 6 piece braid, which is the classic way to make challah. I could try to explain it to you, but I would probably nto do a very good job. 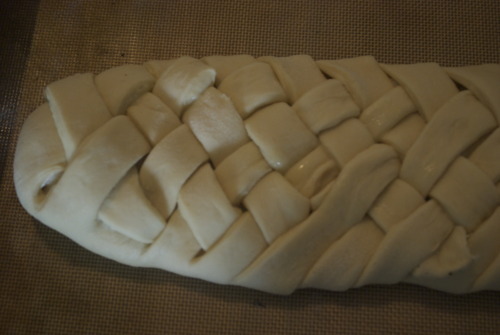 does a great one though- at about 2;12 the braiding part of the tutorial starts. 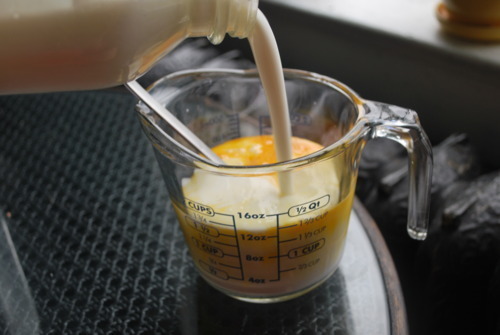 Mix together your remaining egg with a pinch of salt. Brush it on the top of your loaf. Allow it to sit for another 20 minutes, and then brush again. Sprinkle with the sesame seeds or poppy seeds, if using. 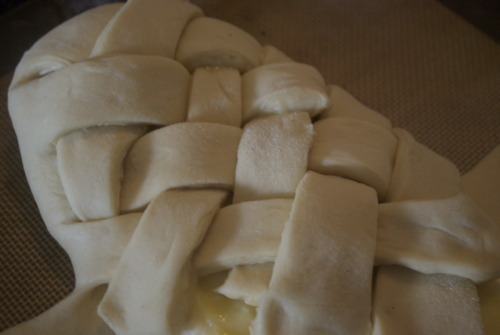 Bake for about 45 minutes, until the top is nicely browned and it feels hollow when you tap it. 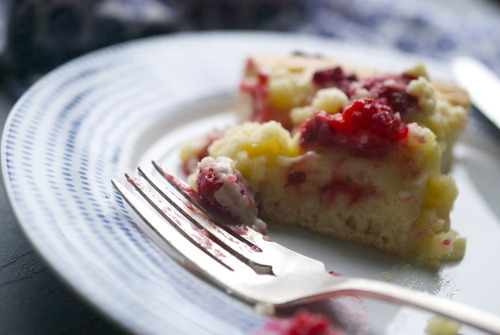 Allow to cool completely before slicing into it! Sometimes in Vancouver it rains. Some might say that most of the time it rains but I’m feeling optimistic so I’m going to say sometimes. Sometimes in Canada it gets bloody freezing. That doesn’t happen much in Vancity, but it has this deep humid chill that gets into your bones. It’s a wet cold that creeps into your shoes, and blows down your neck, and sneaks behind your ears. 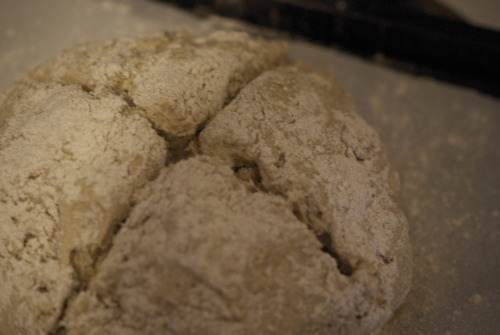 Sometimes, you need to stop feeling guilty and just make Finnish Cardamon Bread. 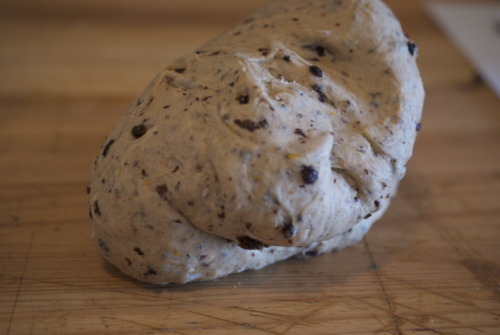 You need to have your whole house smell like rising bread, and you need to feel that comforting squish of yeasted dough between your fingers, and you need to sprinkle cardamon on it, which seems at first a wee bit crazy, but very quickly becomes the best idea you’ve had all day. 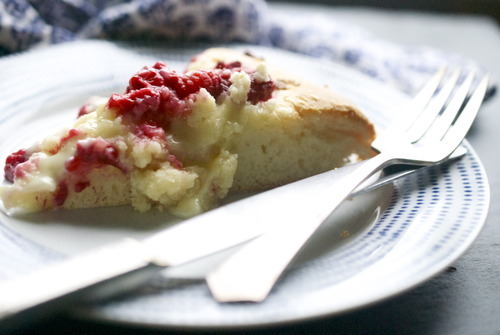 Sometimes you just need to let it rain, you need to make a strong cup of tea, and you need to eat Finnish cardamon bread. And you need to be happy. 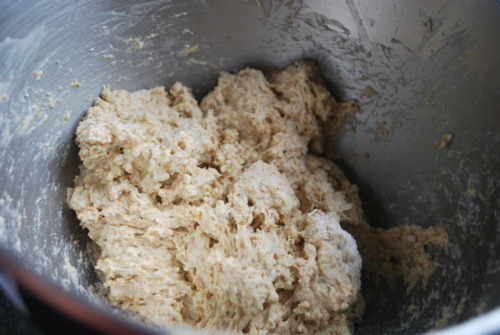 In a small bowl mix together the water, yeast and a pinch of the sugar. 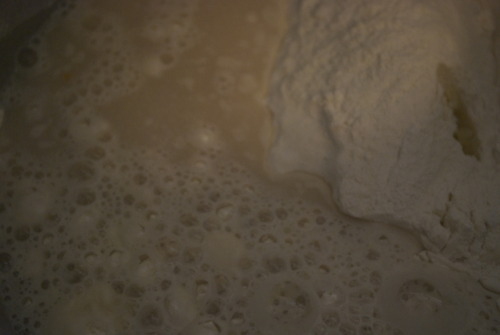 Let this get foamy on the top- that’s how you know your yeast is still alive. If after about 5 minutes you see no movement start over. Make sure the water is about the temperature of your hand- much hotter and you’ll kill it, much colder, and you’ll make it dormant. 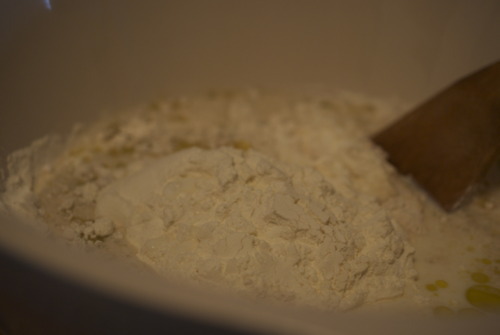 In the bowl of a standing mixer fitted with the dough hook, OR in a food processor with the dough attachment, OR in a bowl with some serious arm muscles, put the remaining sugar, salt, cardamon and flour and mix in the yeast mixture. 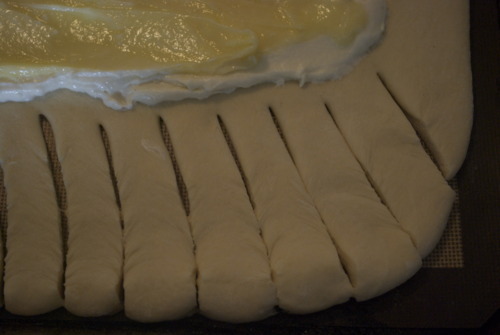 Continue kneading the dough until it all comes together, and when you stretch a small piece of it, it gets thin enough to see light through. Shape it into a ball, put back in the bowl and cover it. 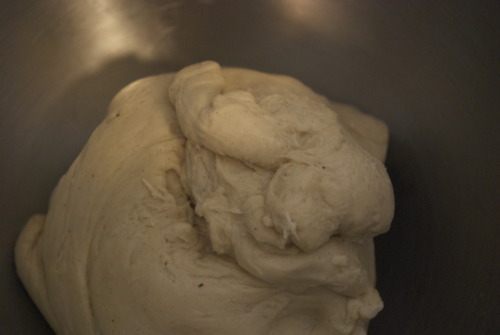 Wait until the dough has doubled in size, about an hour- an hour and a half. 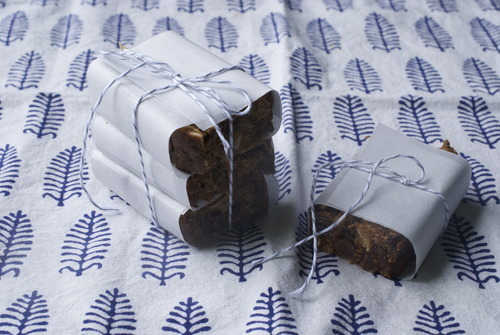 Prepare a pan by covering it with parchment paper. 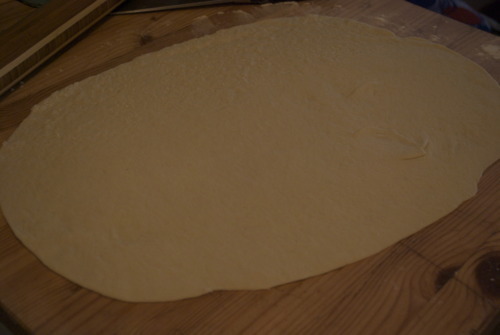 On a lightly floured surface roll out the dough into a large rectangle, about a foot and a half by 3/4 of a foot. 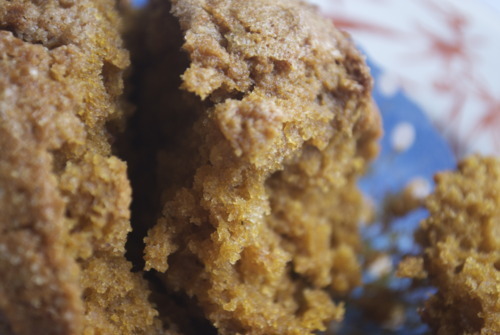 Sprinkle the brown sugar and cinnamon on top- use as much or as little as you want, I used about a cup and a half of sugar and a teaspoon of cinnamon. 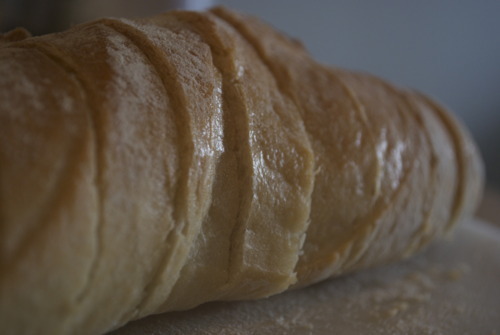 Roll the dough a long the long end so that you have a long thin roll. You can either cut them into rounds and place them on a pan, or you can cut slices almost all the way through, on a diagaonal. Then flip every other slice to the other side side so that going left right left right and you can see all the pretty slices. This is easier to do on the pan then on a board and then have to move it. 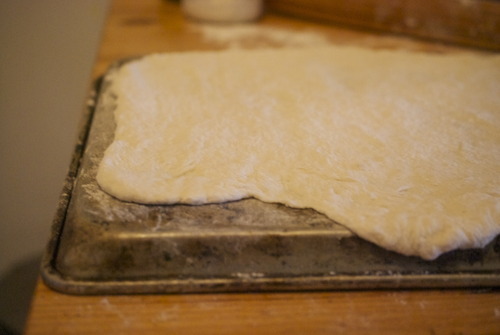 Cover the dough with a tea towel and wait until it has doubled in size again, another hour or so. Bake your bread until it is golden brown. Last week I threw out my back. I could barely walk, I couldn’t work, and mostly I just moped around, and the handsome man I live with was unbelievably nice to me. Made me dinner every night, helped me in and out of baths, brought me ice packs, and hot packs, and just generally got a lot of bonus boyfriend points. So I thought I should throw some love his way, and when I was feeling a bit better I woke him up with homemade apple donuts. 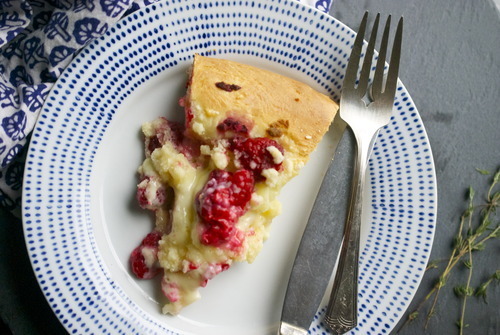 To see the recipe, check out a (self proclaimed) charming story about my dad, and see some more pictures you can head over to Edible Vancouver. 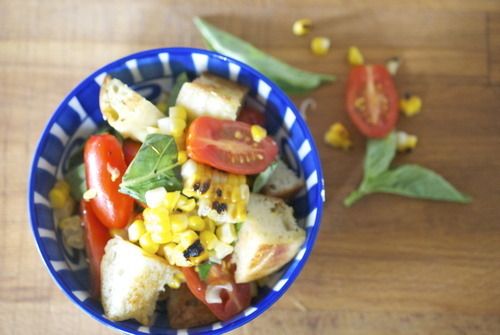 Corn for me is the quintessential high summer vegetable. As a kid my oldest and dearest friends had a cottage in Muskoka that my family used to go to many times a summer. The kind of cottage that’s hard to find these days in Muskoka, amidst all the monster homes that people summer in, this is a real cottage (or as we say on the west coast, a cabin). It was built by my friends great-great-aunt and uncle, from scratch all the way. They even built some of the furniture and sewed the quilts. It was the home to our most elaborate games and biggest adventures as kids, and I loved it. Since moving to BC I haven’t been back, which is alarming and hard as it’s been nearly 6 years now, one of my friends was recently up there and Instagraming pictures and it broke my heart a bit. 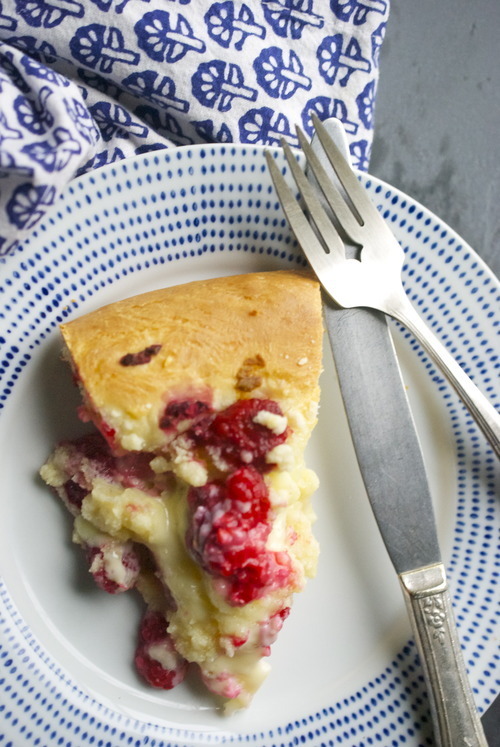 Food was never a big priority up there; besides hot dogs, one great bakery, and traditional Thanksgiving dinner, my food memories from the cottage are few and far between. But I do remember stopping along the way at farmers stands and getting corn. Corn before “peaches and cream” corn, that was savoury instead of sweet and had a much stronger flavour that the kind you can pick up at the grocery store these days, at least where I live. But I found some at the farmers market the other day, bright yellow and deeply flavoured. I grilled it and put it in this salad and it tasted like summer, the idyllic kind you can only have when your on school break and have nothing to do the next day but swim. Grill the corn- for me this means on a grill pan on my stove top. You could do this on a BBQ or under a broiler. You want to get it nice and charred. 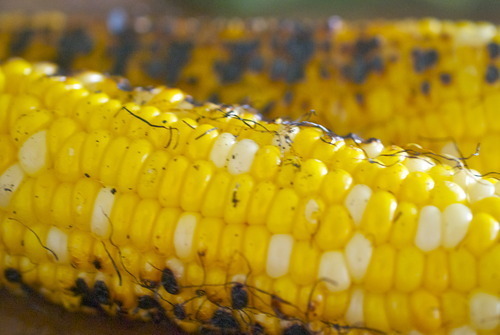 Once cooked take a serated knife and cut the kernels off the cob. In a frying pan over medium heat, warm the olive oil. 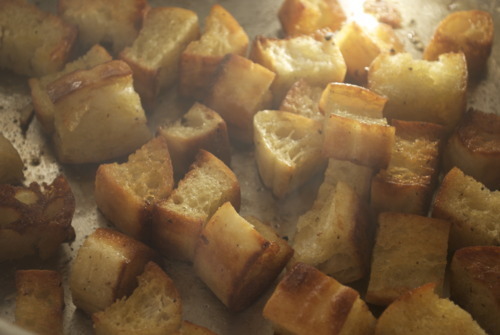 Toss in the bread cubes and toast until it starts to darken on the edges. Salt. 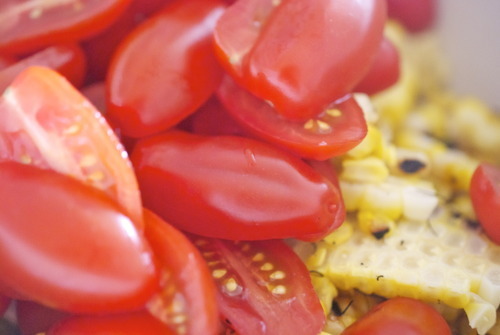 Add the corn and the tomatoes, toss a couple times. Add in the basil and the lemon, adjust the seasoning and serve! I have alway thought, and some people are going to hate me for this, but that the best thing about Vancouver is getting out of it. Thats not to say that I don’t love my neighbourhood, or that I haven’t had many a great night at great restaurants and bars downtown, but it is to say that when you look around Vancouver the most amazing things aren’t the buildings or the culture, but the mountains and ocean that surround it. And the best part of the mountains and the ocean is just how easy it is to get there. And while lots of people make the most of the mountains in the winter time, skiing and snowboarding, I hate the cold and tend to shine in the summer. Which is how I found myself on Savary Island last weekend. I have never seen so many eagles, or starfish, and I’ve never seen such long strips of white sand beaches in Canada. It was exactly what I needed. A quick refresh before all the excitement of my new website took over. Life is feeling pretty good right now friends. On this getaway I took a brought a cake. Something I found in a Maida Heatter book called the Survivor Cake, it’s not too sweet, very dense and moise and this weekend help up to 2 ferry rides and a water taxi each way, and paired beautifully with both coffee in the morning and a glass of red mid afternoon. 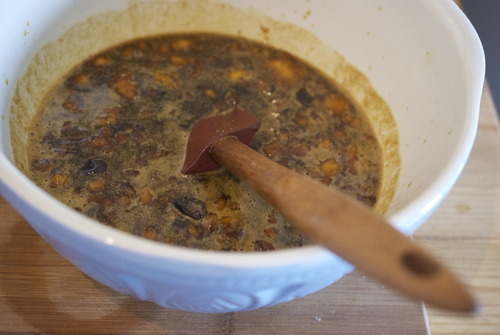 In a small pot over medium heat bring the sugar, molasses, bananas, coffee (or water) raisins, cranberries and butter to a boil. Making sure the bottom doesn’t melt keep it on the heat until the butter is completely melted. Take it off the heat, pour it into a bowl and let it cool to room temperature. 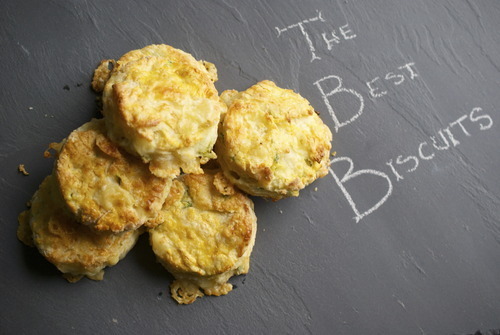 Line a 9 inch square pan with parchment paper. 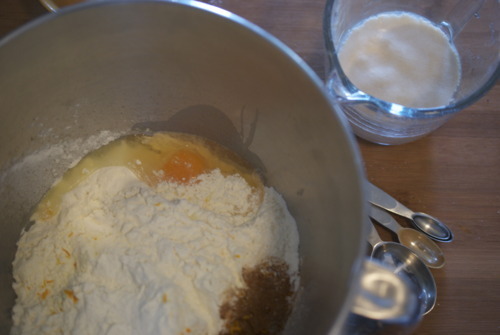 Into the bowl with the butter mixture add in the eggs mixing with a wooden spoon. 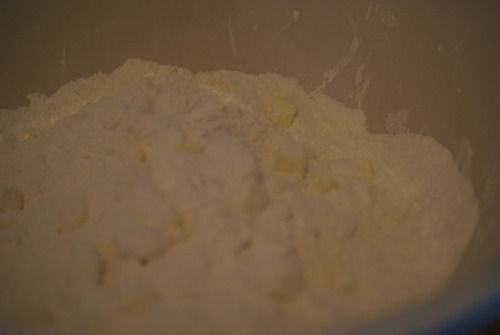 Slowly sift in the dry ingredients and stir until almost combined. 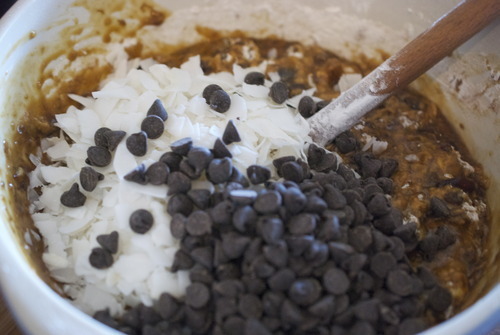 Add in the coconut, chocolate and the walnuts. 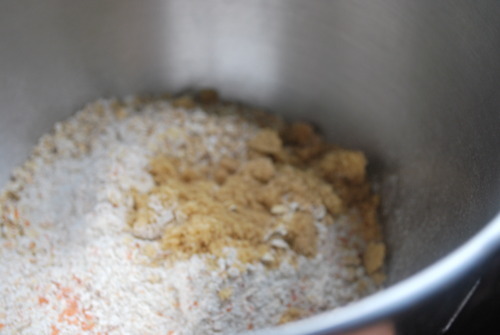 Mix until their are no more streaks of flour but not any more and pour into the prepared pan. 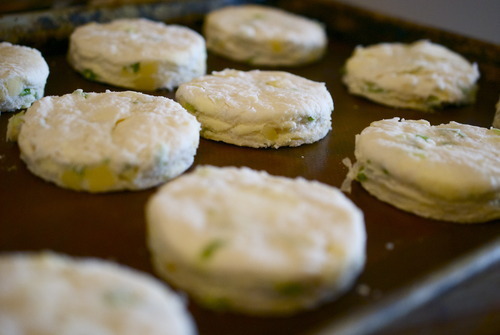 Bake until an inserted skewer comes out with only a few moist crumbs, about 45 minutes. 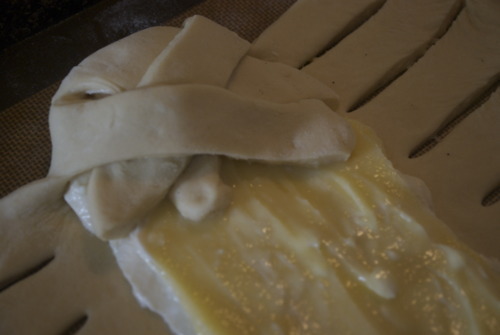 Allow to cool and then wrap tightly, it will keep moist for nearly a week! We might be moving to the country. It’s not for sure yet, but there is a real chance we might pick ourselves out of the most expensive city to live in in North America and curl up on Vancouver Island. This appeals of me on many levels, mostly because when I think of living in the country and I don’t think of isolation or hard winters. Instead I day dream about long summer days in the garden. I fantasize about growing my own veggies and taking long walks in the fields at sunset. I get a glazed over look when I think about hanging my sheets out to dry or having a fire place or having enough room to build the bed I’ve always wanted to make. 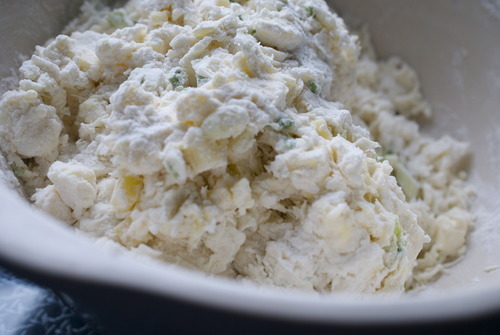 And when the logical man I would be moving with tells me I’m absolutely ridiculous and there are other things to consider when making a move like this I simply make this wonderful rustic bread, and strain some ricotta cheese and imagine that my eggs came from my yard, and I slip back into my imaginary world. 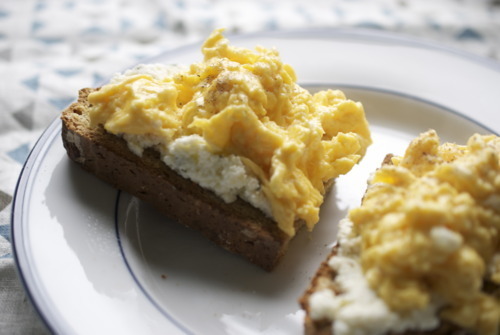 Because fresh eggs and oat stuffed soda bread arecompletely at home there. 4 Good Quality free range eggs, splurge and get the good ones if you can. It really does make a difference. 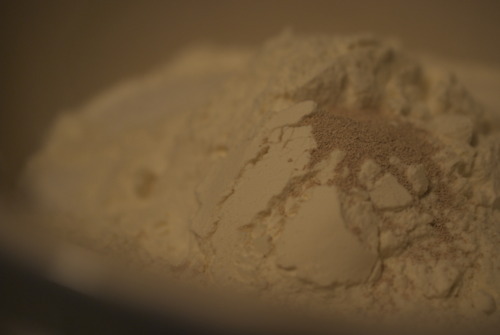 In a food processor blitz 1 cup of the oats to a fine powder. If you don’t have a food processor don’t worry. Your bread will be delicious anyways, I promise. Mix it in a bowl with everything else except 2 tbsp of the whole oats. Mix it all together until just combined. 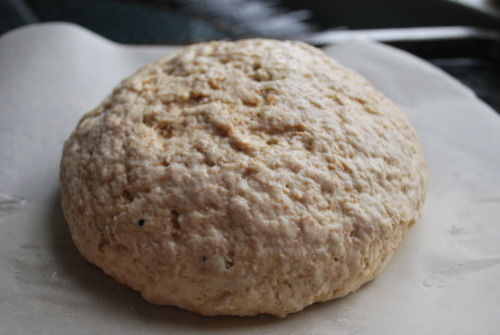 Gently knead it a few times and then form it into a ball. Cut a deep X on the top with a sharp knife and put it in the oven! Bake until it is cooked all the way through, about 45 minutes. It will have a thick crust and sound hollow when you knock on it. 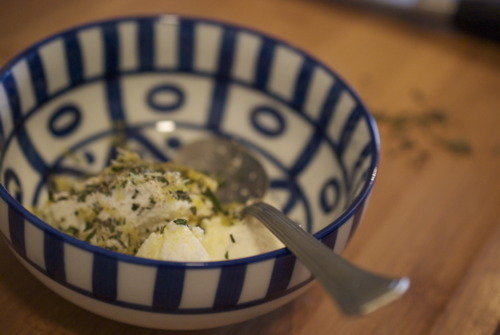 Meanwhile mix together your herbed ricotta. Just mix it all up in a bowl and check the seasoning. When the bread is out of the oven, let it cool for a few minutes. 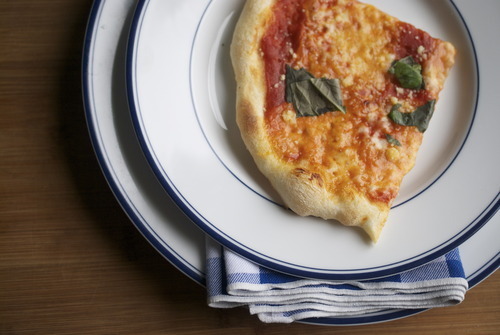 Slice it up and slather it with the ricotta. Now, seconds before your ready to eat your ready to cook your eggs. Here is how I cook mine, and how I like my eggs best. 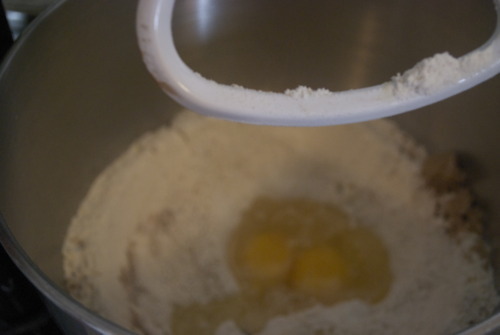 Crack your eggs into a bowl and whisk them very well. How fluffy they are is a direct correlation to much you beat them. Whisk in the cream if using. Get a small frying pan hot. 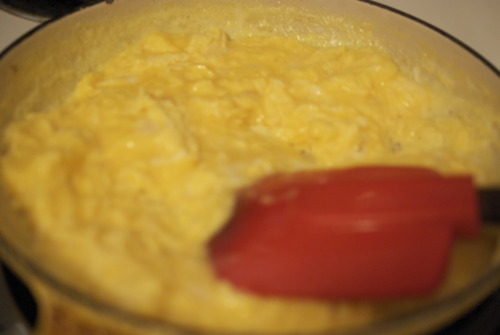 Add in the butter and swirl it around for a second then, before it has fully melted add in the eggs. Now stir them slowly. 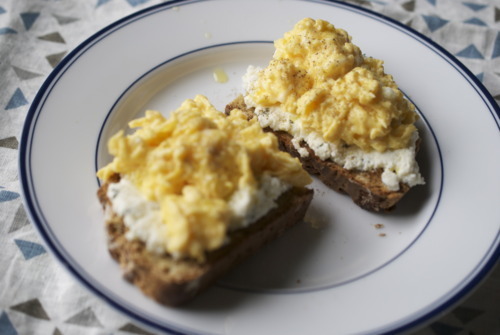 I like my eggs with big pieces of scramble, and to do that you need to work the eggs slowly but throughally. 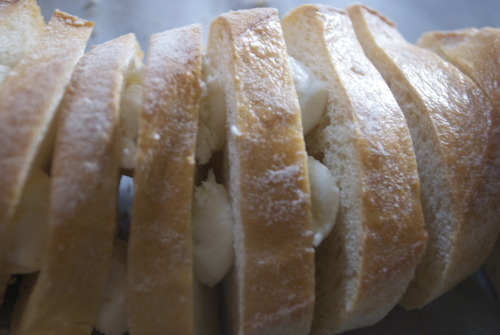 When they are still a little shiny take them off the heat give them one last stir and quickly scrape them onto the ricotta slathered slices of bread. 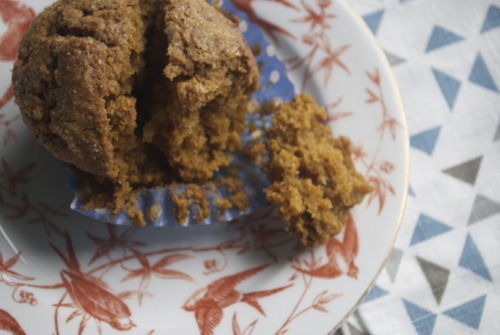 And then eat it quickly and happily, and imagine your sitting on a farm in the country! My mom does not like to bake. I don’t remember her ever making bread or pizza dough, there was a good bakery near us growing up and that was good enough for us. The only time she ever got the yeast out and used it, was for hot cross buns. She would make it right before bed and put it in the fridge over night. 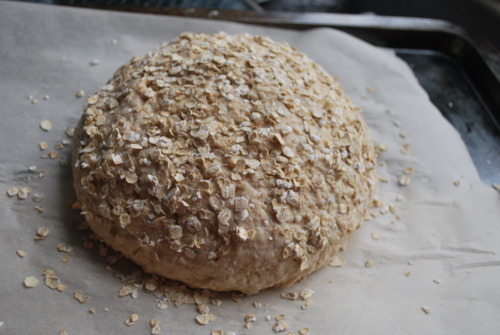 In the morning she would wake up before all of us and pull it out, and let it proof and we would wake up to the incredible smell of freshly baked bread. It was such a treat. 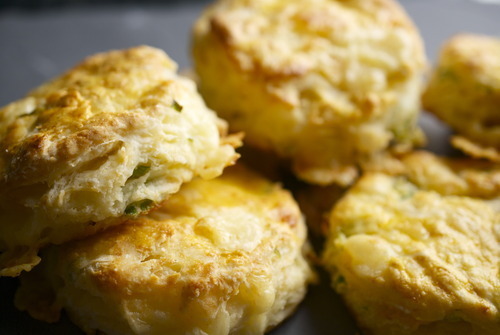 My mom loyally made Marion Cunningham’s for years, and they are darn good. 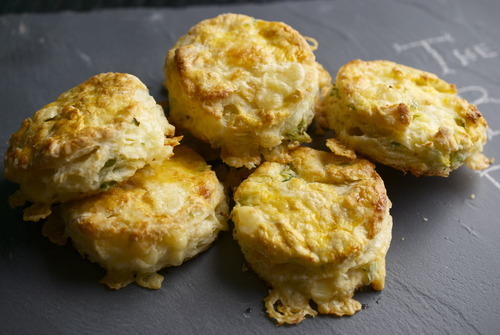 But I had some at a friends house a few years ago that had more of a spice to them, and when I saw this Jamie Oliver recpie I just had to try it. 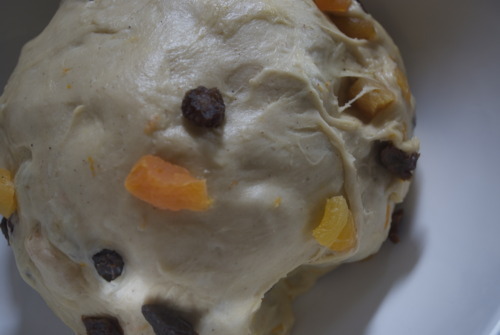 These are beautiful hot cross buns, with more then a vague hint of spice they are very soft and gently sweet. I made a few changes, I use honey instead of sugar, and I added salt, because everything tastes better with a bit of salt, and they are splendid. 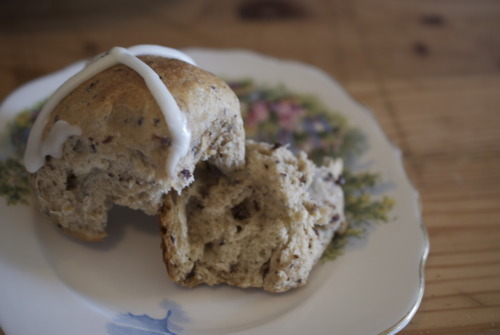 And officially my new go to hot cross bun recipe! 2/3 cup Water- warm but not hot, about the temperature of your body. 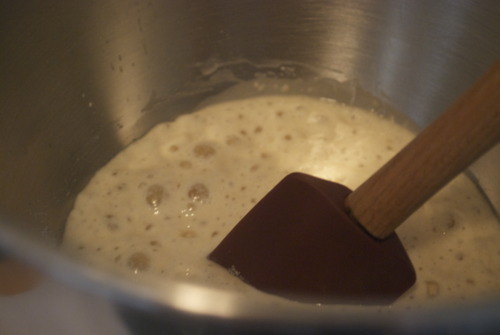 Mix 1 tablespoon of the sugar with the yeast and water, and let it sit until it gets frothy on the top. 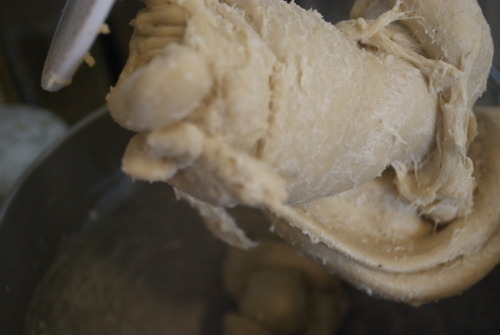 Meanwhile, in the bowl of a standing mixer fitted with dough hook mix all the other ingredients. 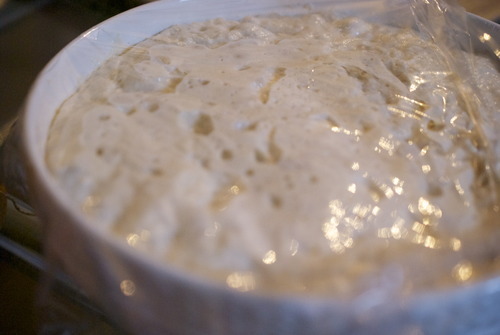 Make a well in the middle and Pour the yeast mixture into it. 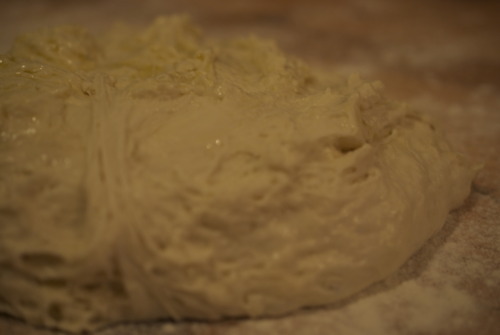 On slow to medium speed mix the dough until it becomes soft and elastic, and if you stretch a little piece of it with your fingers you can get it so thin you can almost see through it. Put it in a bowl and let it sit in a nice warm place for about an hour or until it has doubled in size. Once it’s nice and big take it out of the bowl, put it on a work space- if it’s sticky you can add a bit of water but you shouldn’t need to. Cut it in half and then roll out each half into a log and cut into 6 equal pieces. 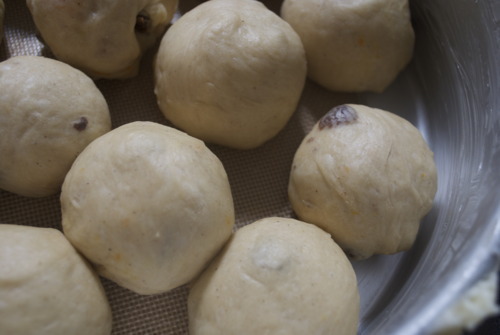 Roll them into balls- put the palm of your hand over each piece, apply a decent amount of pressure and slowly move your hand in circles. After about 4 circles flip the piece upside down- it should be sealed on the bottom. If it isn’t, push it into a few more circles. 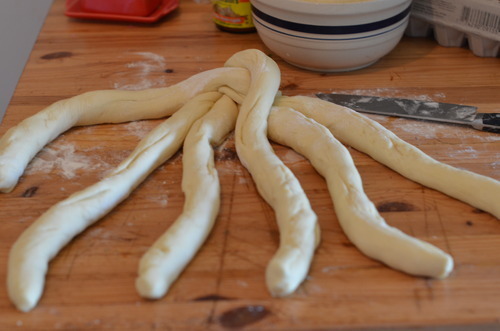 This takes some practice, but don’t worry if they’re not perfect. 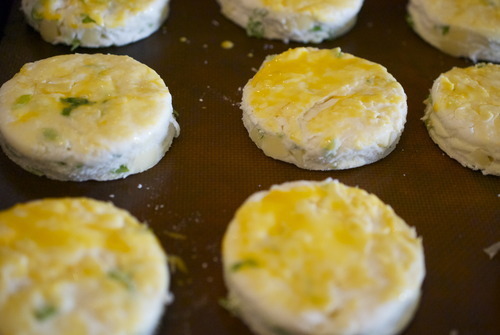 Put them into a buttered baking dish- I used an 8x8 inch square pan. Cover with seran wrap and let sit until they’ve doubled in size again. 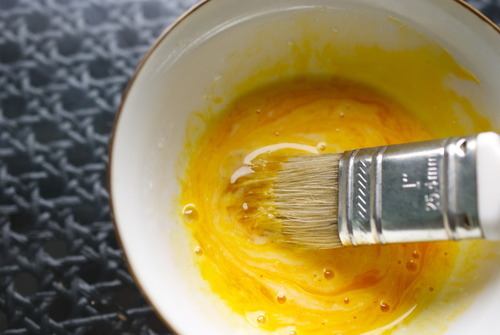 Mix your egg wash and gently brush it on top of the buns. 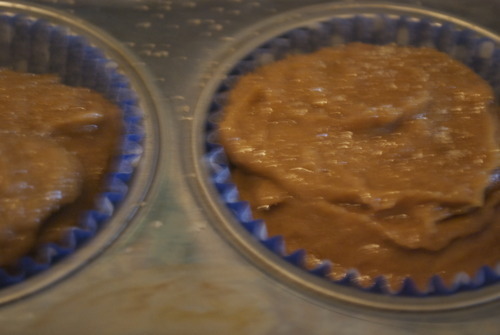 Once they have cooled mix your icing- Combine 1 tbsp of milk or cream with the icing sugar and mix until they’re totally combined and lump free. 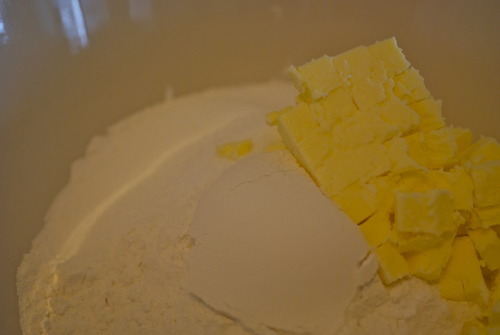 If it’s too thick add a little more cream, if it’s too thin add a little more icing sugar. 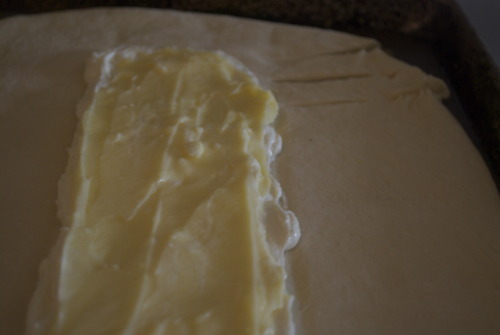 You want it to be reasonably thick so it will stay in nice lines. Put the icing in a piping bag and pipe on the crosses. know, I know, I’m slow to the trend here. 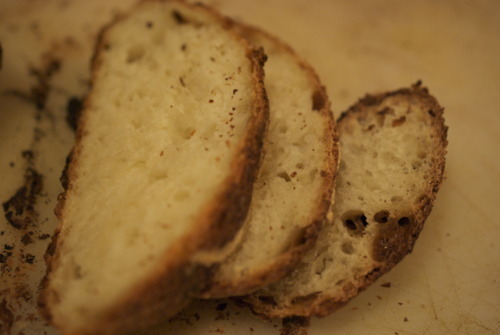 In my defense, when the Sullivan Street Bakery Cookbook came out a few y ears ago, I did make the famous no-knead bread a few times, and I thought it was great, honest, but somehow it got pushed to the back of my mind and I forgot about it. 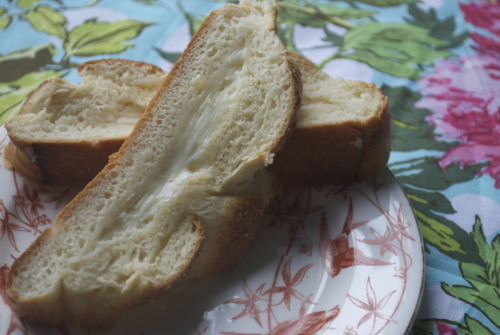 I tried a few other kinds of bread, the kinds that are laborious and time consuming and rarely work with my crappy oven anyways and then out of the blue I remembered. 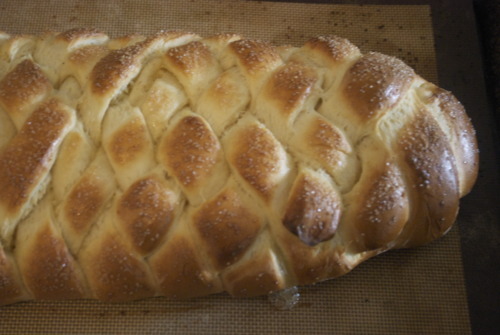 I am going to make this bread ALL THE TIME. Seriously it’s delicious. 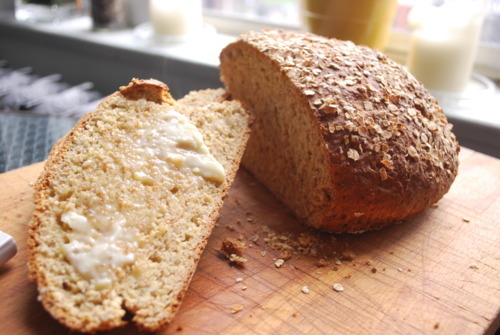 It’s also so simple, so easy, so entirely something I can throw in a bowl before I go to work and finish when I get home so I can have freshly baked bread with my supper. And there are very few breads I have time to make on a work day, so that’s no small miracle in my books. Add the water and mix for about a minute or until it’s lump free and starting to feel very soft. 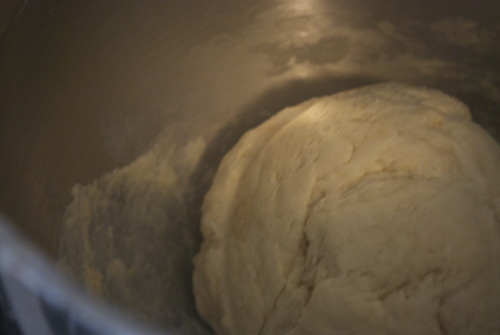 Put the dough into another bowl that has been brushed with olive oil. Cover it with cling wrap and let it sit for 12 hours. I’d be lying if I said I did this. It was 10 max and my bread was still wonderful. 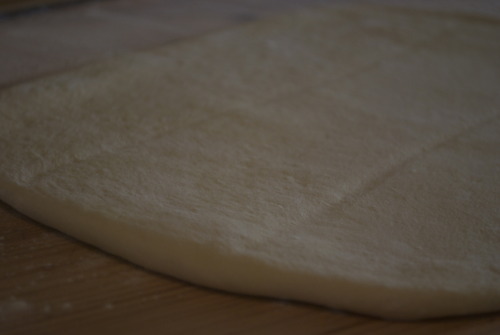 Once all this time has elapsed put the dough on a well floured surface, fold it few times and let it sit for 15 minutes. Now form it into a ball (don’t be too fussy with it) and let it double in size. This took over 2 hours for me but my apartment it a little chilly. Preheat your oven to 450F and put a 4 quart pot into the oven to get hot. 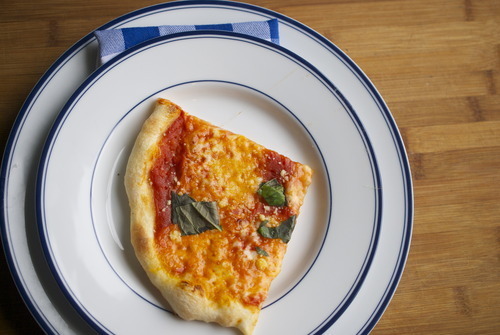 Once the oven is totally preheated and the pot is scalding take your dough, flip it upside down into the pot, put a lid on it and slide it into the oven for 30 minutes. After your timer goes off take the lid off and cook it for another 15-30 minutes until it gets a deep aubourn brown. Mine got a little further then brown and it was still delicious. Take it out of the pot (careful now, don’t burn yourself!) and let it sit for at leaste 20 minutes before you carve into it. The bread will be better and you will be able to digest it better once it sits. Cest Finis! My Aunt Loretta is an amazing cook. Truly terrific. The sort of woman who teaches healthy cooking classes to cancer patients, raised an incredible cook for a son, and makes the marshmallows from scratch that she uses on top of her sweet potato cassorole for Thanksgiving. She does this all with a huge smile on her face, immaculate nails and hair, perfect clothes and just the right amount of southern sass. She is a force to be reckoned with, let me tell you. She emailed me a while back about a tomato bread salad that she did up with cod, and it sounded amazing because, well, I’ve never had anything shes made that wasn’t spot on. So when my favourite neighbours dropped off some tomatoes from their community garden last week I could think of nothing else beside big chunks of bread fried in olive oil, big juicy pieces of local tomatoes and big leaves of basil all bound with lemon juice and capers. 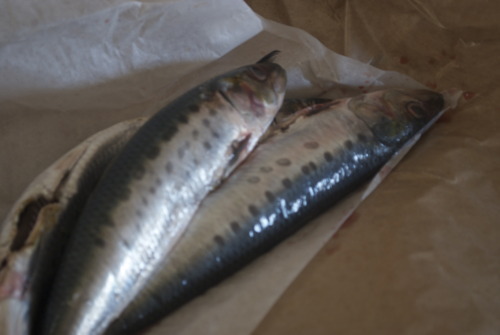 I bought some local mackerel because I love mackerel and it’s local here and cod isn’t but use whatever you can get! 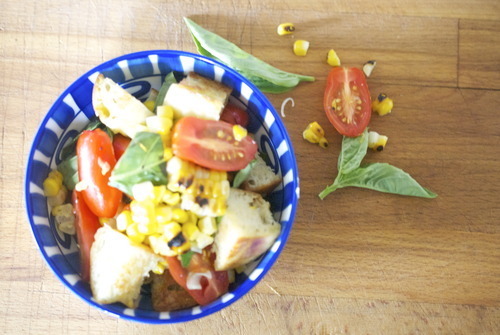 So here it is, Aunt Loretta’s Panzanella. 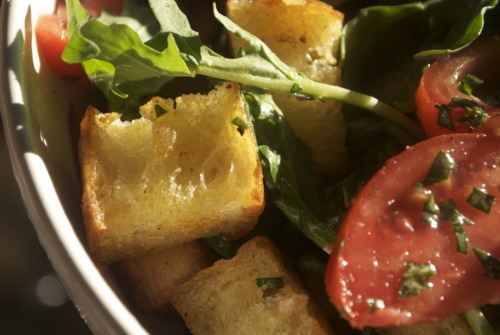 2 Roma tomatoes, 1 beefsteak, or a big handful of cherry tomatoes cut into wedges. 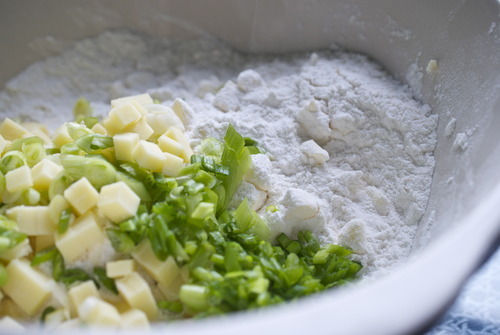 Mix together the flour, the zest and a tespoon of salt. Dredge the fish in it. 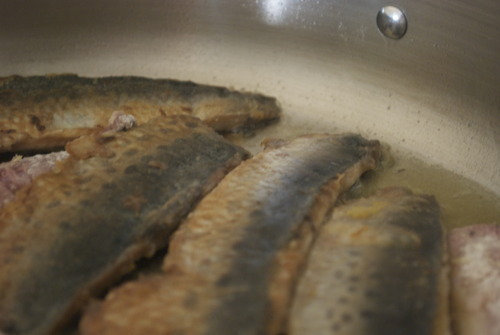 In a small frying pan over medium high heat and add in a tablespoon of olive oil and fry the fish. Put the skin side down first and cook it almost all the way through then flip them and finish cooking the flesh side. Keep them warm in the oven. 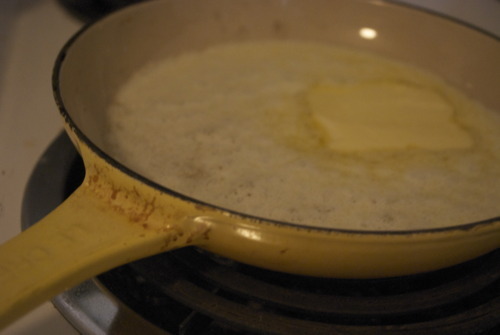 Warm a large skillet over medium heat. Add in 1/4 cup olive oil and fry up the bread flipping it reguarly until the bread is a glorious golden brown. 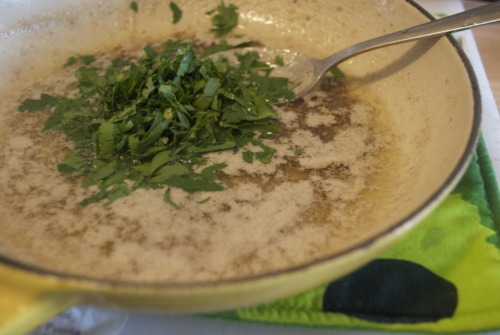 Meanwhile Mix the lemon juic, 1 tbsp olive oil, capers in the bottom of a large bowl. Add in the tomatoes, arugala, and the basil and toss to combine. Add in the bread and toss again, serve immediately with the fish on the side. My “Aunt” Silvia is an endlessly chic Roman woman who fell in love with a brilliant Canadian man, my “Uncle” Frank. The best job for him was at McMaster University in Hamilton Ontario and thats where they lived throughout my childhood. Aunt Silvia was not like anyone else I knew. She has an immaculate salt and pepper bob, wears nothing but black, and is looks endlessly chic smoking like a chimney, the way only French and Italian woman can.She had a beautiful husky voice, and a fiery temper. When my Dad was doing his PhD Uncle Frank was his Professor and my Mom ended up becoming very good friends with his wife. I picture them in the late 70’s, both beautifully dressed, making wonderful meals and talking about literature. We didn’t visit all that often, they lived about an hour or so away from us, and while I remember eating well when we went to visit, mostly I remember so many of the staple things my Mom used to make that were recipes from Aunt Silvia. Those really simple Italian meals that just take four or five ingredients but turn into something magical. The one I remember most is Roman Crostini. It’s one of my all times favourite things, in fact, if you look in my grade 2 yearbook you’ll see that “crostini-nini” is listed as my favorite food. 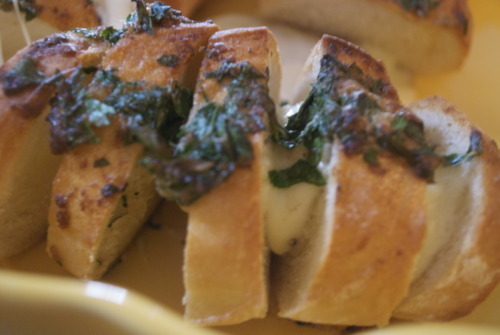 The best par of crostini (nini) is that it literally takes 5 minutes. It’s a perfect h’or deurve and it’s always a crowd pleaser. It’s super cheap and, once again, it literally takes 5 minutes. 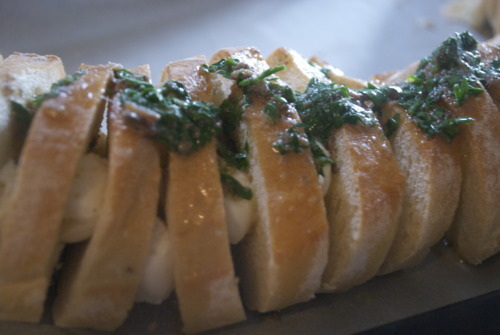 It doesn’t take much, just good bread, good mozzarella, and fresh parsley. The secret ingredient is anchovies, which are so prevelent in Roman food and so absent in ours. I have served this to people who swear they hate anchovies, (after making sure there are no allergies) and they’ve loved it. The anchovies just disintegrate into the olive oil leaving this rich deep flavour without any fishiness. 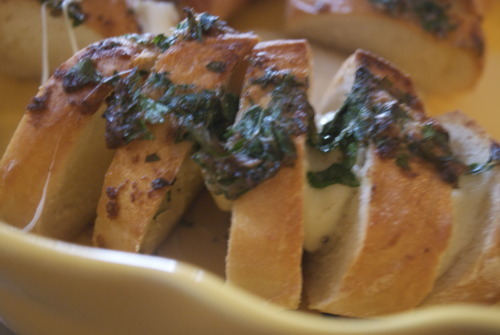 And then the cheese oozes in and the bread crusts up and the parsley just makes it all snap together. It’s amazing, and it takes 5 minutes to make. 1 good quality Baguette, it can be stale! 3 Anchovy Fillets, get the good ones, packed in olive oil. 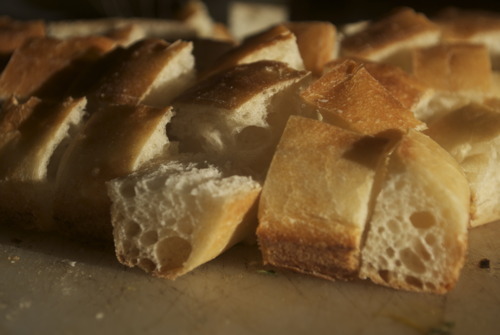 Cut the baguette into slices, leaving the bread just barely attached at the base so that the loaf still looks like a loaf afterwards. If you cut through the bottom a couple times, don’t worry about it, just keep going. 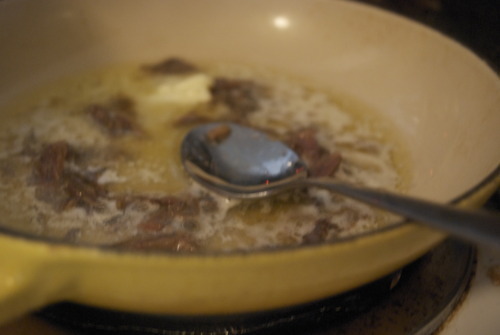 Cut up the anchovies in the smallest little strips and then cook them in butter or olive oil on medium low heat, squishing them with the back of a spoon periodically to help them fall apart. 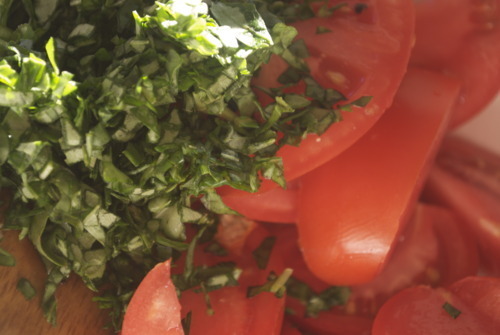 Then take it off the heat, chop up that parsley and add that in too. Then pour it on top of the bread. You can let it sit like this for a while too, if your making dinner, and then pop it in the oven just as friends are arriving. Or you can make it right away and eat it right away. 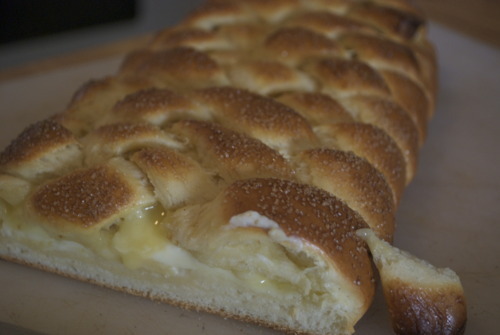 Then pop it in the oven until the cheese is oozing, the bread has browned, and your house smells amazing. Throw it on a plate and eat promptly. Restaurants are funny places. You work 12 hour days, you work every night and every weekend and are made to feel terribly guilty if you ever take a holiday. You make absolutly no money and but you become intoxicated by this world. You work for complete sociopaths and thats a good thing. It gives you bragging rights. So when I was 19 and had big lofty ideas of being a famous pastry chef I worked at a very fine dining Italian restaurant in Vancouver, that shall not be named. It was the sort of place where you were encouraged to do nothing but show up on time and follow orders. The sort of place where he had 10 different ways to do everything, so he could come up to you at any point and tell you you were doing it wrong. The sort of place where recipes were not given to cooks, and cooks were not encouraged to ask questions. It was without question the worst job I have ever had. 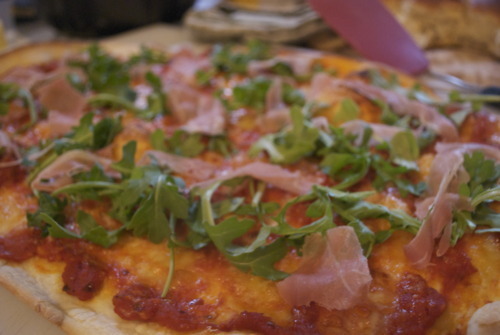 I have nearly no recipes from that time but strangely I have one from something he made only once; pizza. 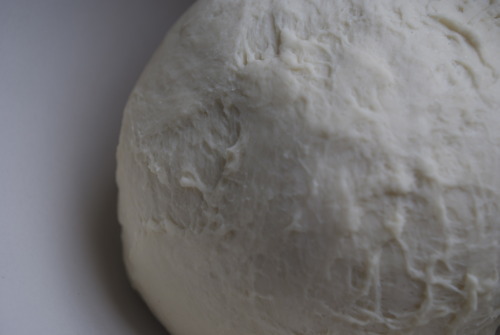 It’s not a complicated recipe, but the dough is wonderful, its soft and pliable and it rolls easily and it crisps up beautifully in the oven. 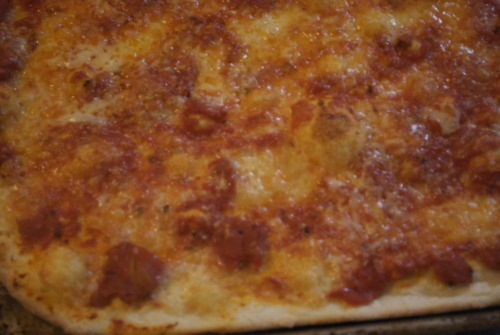 He also put a lot of ingriedents on the pizza after it had cooked, like arugala, or proscuitto, or salami. I had never seen that before. 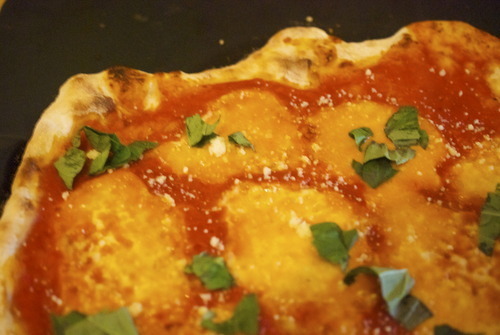 It makes a wonderful very fresh tasting pizza. It’s not greasy, and it’s not heavy, but its very satisfying all the same. 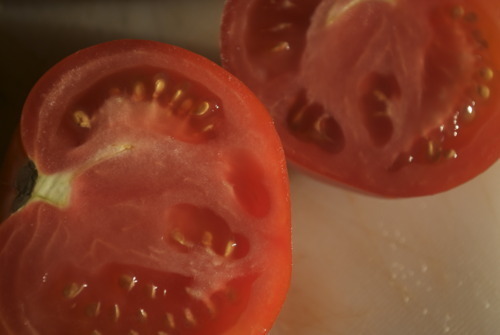 1 can of Tomatoes, try to find a brand without added citric acid. 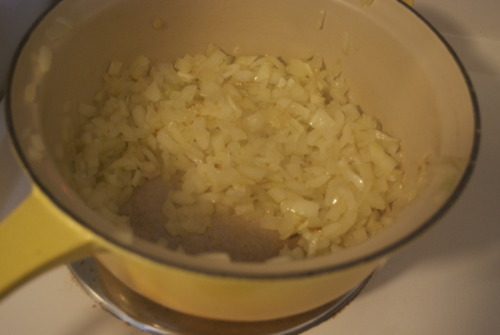 In a medium sized pot on medium heat, add the olive oil and the onion, cook for a few minutes then add the garlic. Stir until the onions are translucent and the garlic is fragrant. 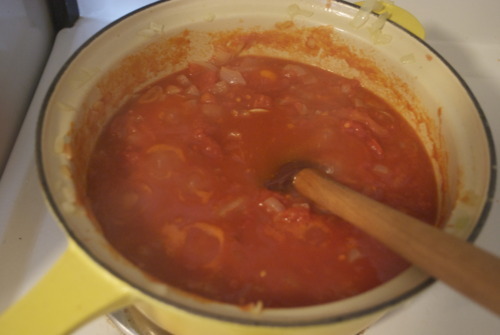 Add in the tomatoes and cook until it gets thick and saucey, about 15 minutes. Season to taste. 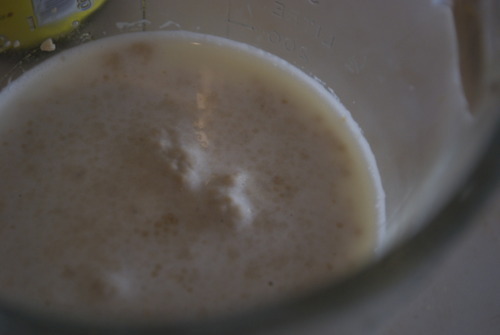 Mix the water, sugar and yeast together until the yeast gets foamy on top, about 10 minutes. 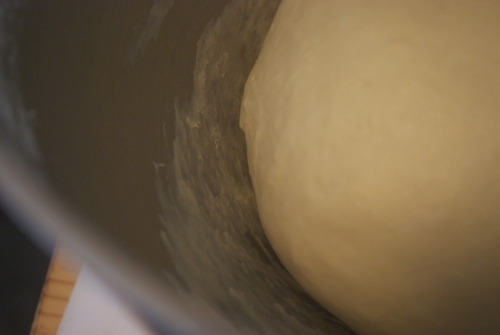 In the bowl of a standing mixer fitted with the dough hook mix all the ingredients. You can also do this by hand if you have more patience and arm strength then me. 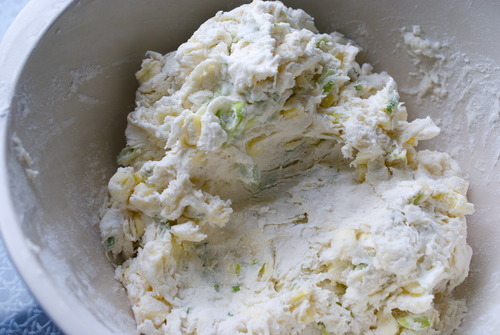 Mix it until it becomes a smooth elastic dough. 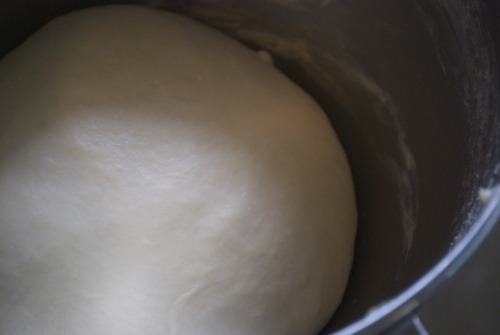 Place dough in a bowl, covered, in a warm place until it’s doubled in size, about an hour and a half. Preheat oven to 500F or the hottest it will go. 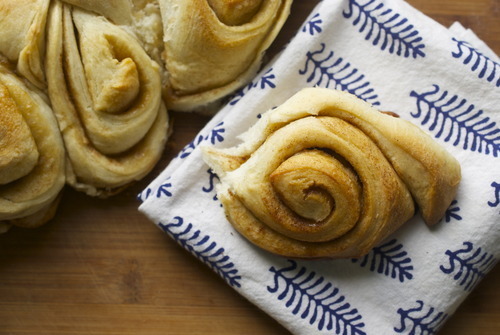 Cut the dough in half and roll out to the size of your pans, the bigger the better. 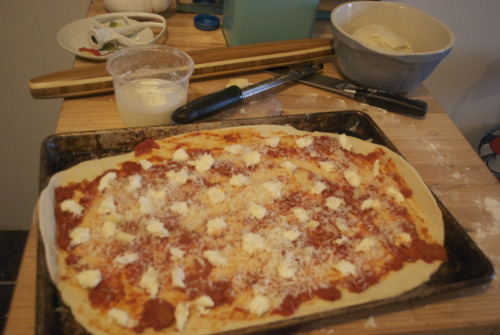 Top with the sauce, and the cheese, breaking apart the boconccini and grating the asiago. 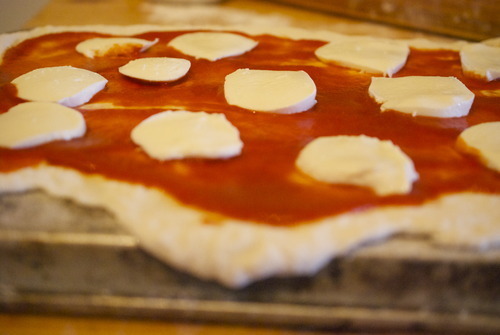 bake for about 10 minutes until the cheese is brown and the crust is cooked. 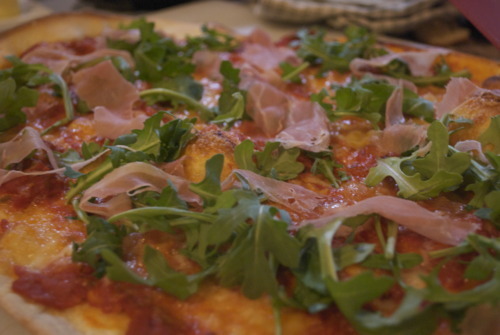 Tear the basil and prosciutto on top and sprinkle the arugula. Eat and be happy! Heres the thing, aside from the year my mom made a tomato based lamb stew and my sister had a fit thinking it was chunks of lamb in blood, I don’t remember what we ate for Easter dinner. 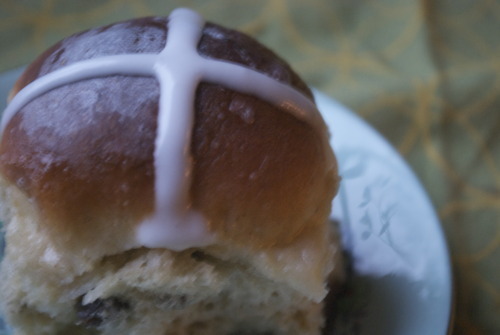 I’m sure it was great, my mom is an amazing cook, but all I remember about Easter is painted eggs and hot cross buns. 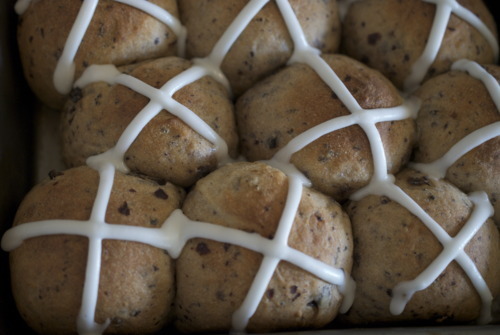 Hot cross buns made quite an impression. 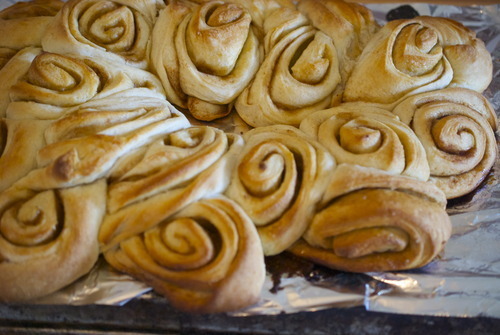 My mom never made bread or cinnamon buns or anything like that, the sweet yeasty smell of fresh bread in the morning was a pretty foreign thing, and it was wonderful. 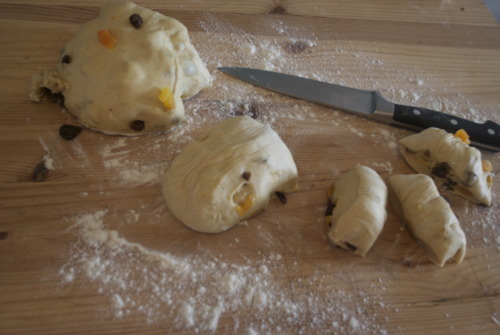 Those little buns, dotted with candied fruit and currants still warm. My mom would wake up early and let them proof so they were just cooled enough to pipe the X on them in the before we ate them. 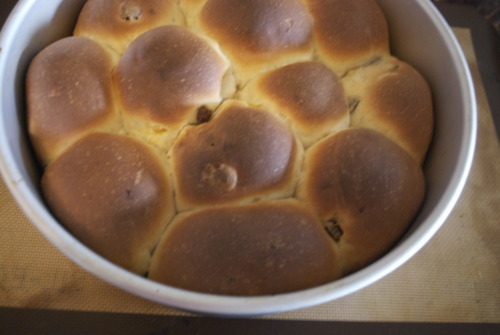 And now, because I live 3500km away from her, I bake them myself at Easter and think of her. 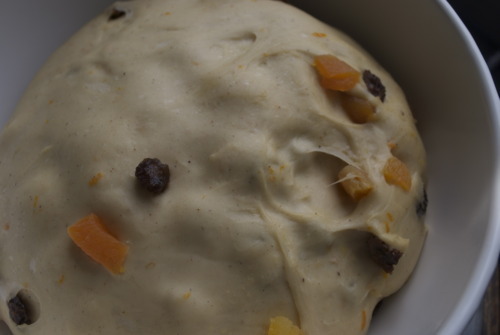 ½ cup dried fruit, I used currants and apricots, but if you could find dried cherries or blueberries you’d really be in businsess. 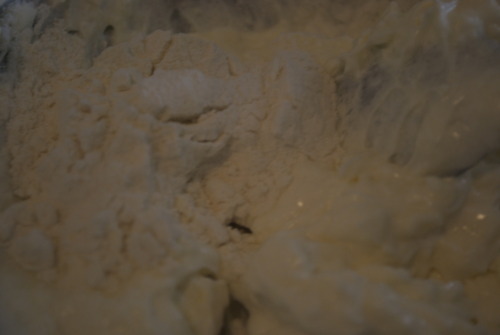 Mix together the yeast, milk, and white sugar and let stand for about 10 minutes or until foamy. 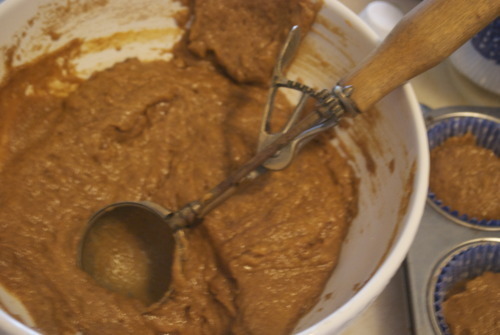 In the bowl of your standing mixer fitted with your dough hook put your flour, cinnamon, brown sugar, eggs and salt. See? I told you it would be fine. 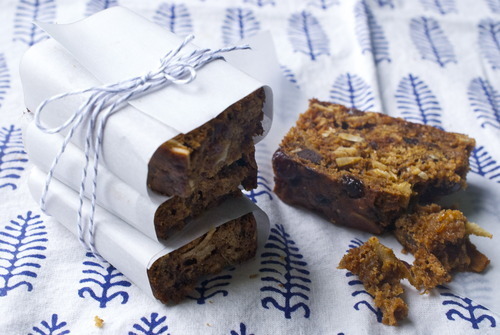 Now add in your dried fruits, you may have to do this by hand. 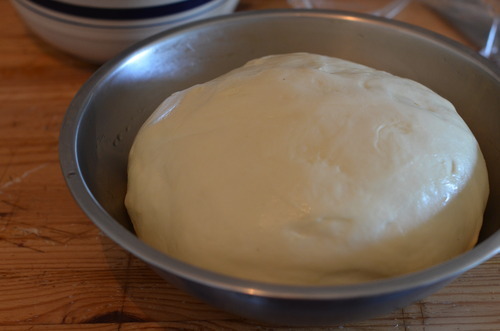 The let it sit, covered, somewhere wam for about an hour to an hour and a half and let it rise. 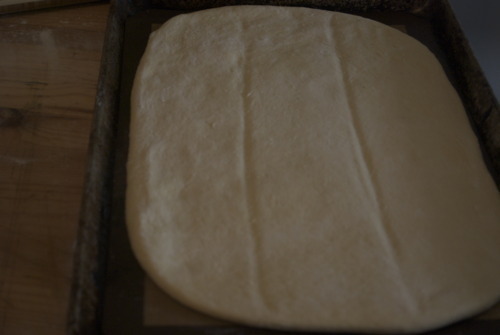 Now put the dough on a floured board and cut it in half. Cut it in half again, and then cut each quarter into thirds. 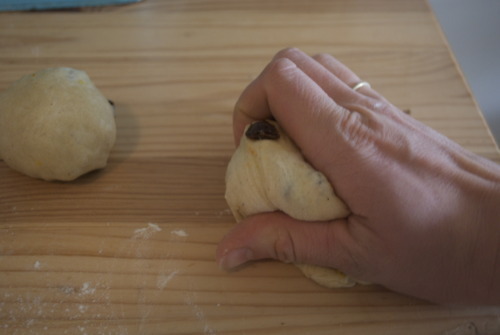 Take each piece, and off the flour, squish it down with the pal of your hand, while keeping your fingers wrapped around it, push it in circles until there is no seem on the bottom and it’s a nice tight round ball. When they’re all rolled put them in a greased pan and let them proof. 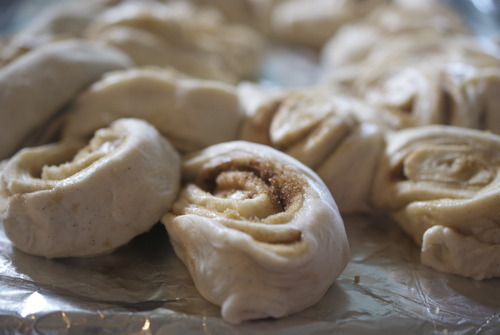 I like mine to stick together like sticky buns but if you want yours individual you can just space them out more. 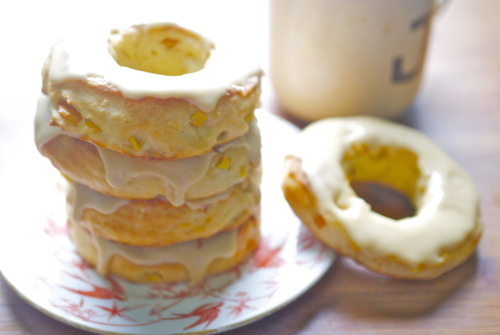 Also if you want to bake these off the next morning just stick them in the fridge wrapped, and pull them out about 2 hours before you want to bake them. 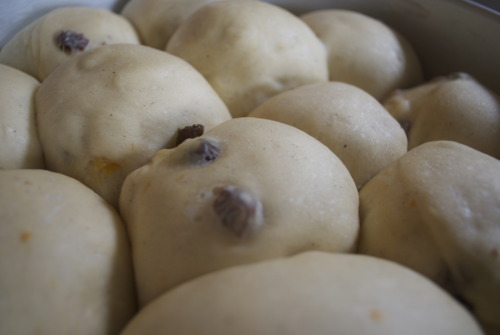 Once your buns have doubled in size stick them in the hot oven and cook for about 15 minutes, or until they are golden brown on top. I cooked mine a little to much, so make your slightly lighter then mine. 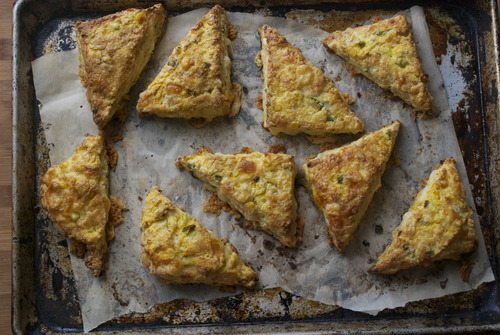 Pop them out of the pan and let them cool on a rack. 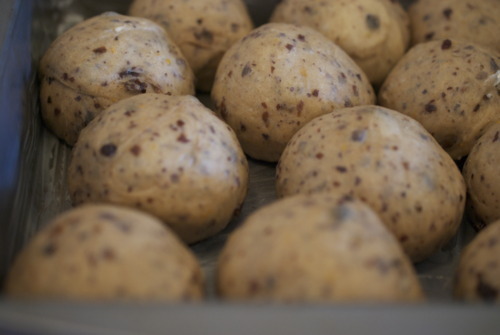 Ice them with an x once they’ve cooled and your done! Sometimes all you need is this life is some fresh bread. Good homemade hot out of the oven fresh bread. 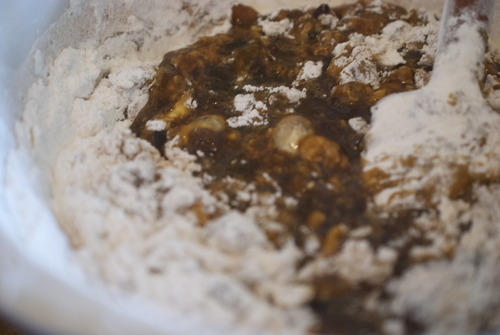 You need your house to smell like browning flour and you need to watch it grow in the oven into something magical. 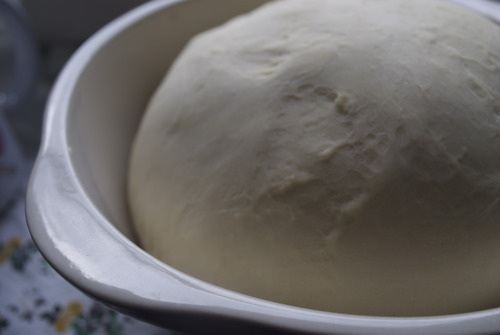 You need to slather it with butter and jam and you need to not feel guilty about that because you made the bread and your eating the fruits of your labor. 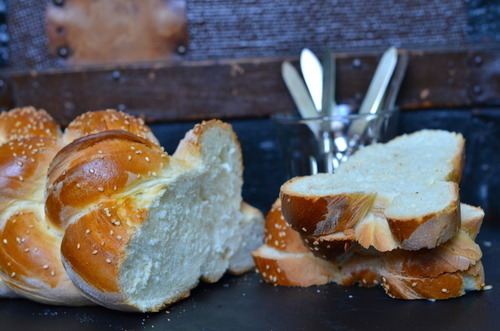 You need homemade bread. 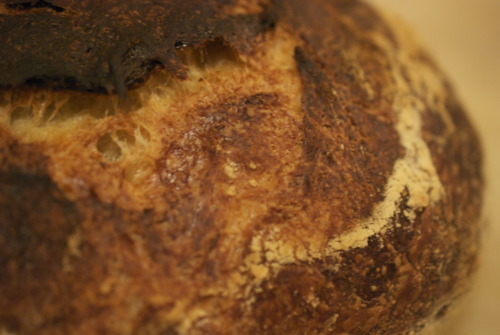 But sometimes you don’t have 2 days to make good bread, or 2 weeks to make sourdough. Sometimes you need instant gratification. Or at least, 2 hour gratification. 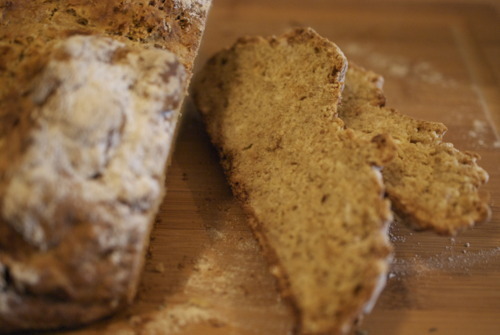 Sometimes you need Irish Soda Bread. 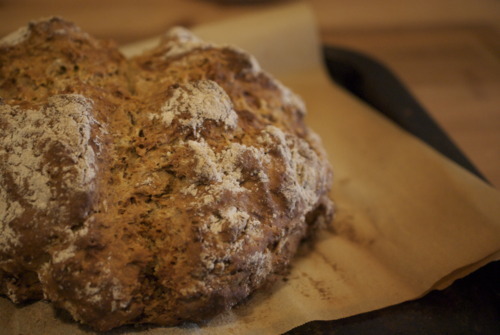 Irish soda bread is the denser, more rustic but very charming cousin to French or Italian bread, and maybe a sibling to cornbread.It is usually made with brown flour, although I did some research and found that white bread would be special occasion bread. 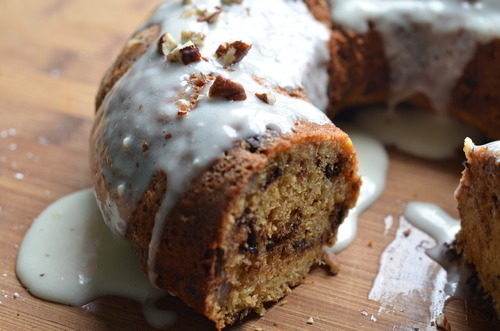 It’s leavened with baking soda (hence the name) and it’s delicious. Seriously delicious. It’s also seriously easy to make. You simply mix the wet, mix the dry and mix it together. Like making cornbread. 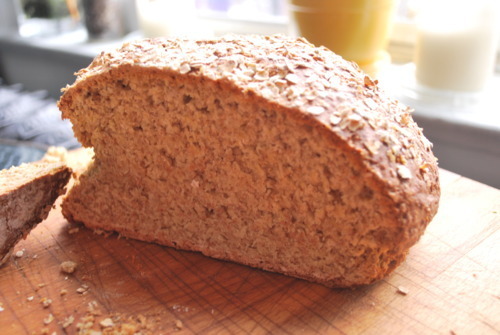 But this is a recipe where the whole is greater then the sum of it’s parts because out of this simple mix comes nuttier, moist, completely wonderful brown bread that begs for butter. I think this is the sort of bread not to over complicate. 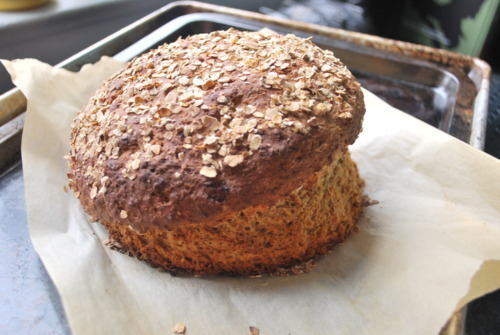 There’s a great article in Epicurious about the origins of soda bread and it says that there should only be buttermilk, soda, flour and salt in it, but this recipe has some brown sugar and some oats as well, mostly because I like oats and brown sugar. So there. Bake for about 40 minutes or until it’s nicely browned and an inserted skewer comes out with only a couple moist crumbs. Let it cool off the pans for about 10 minutes before slicing and eating!